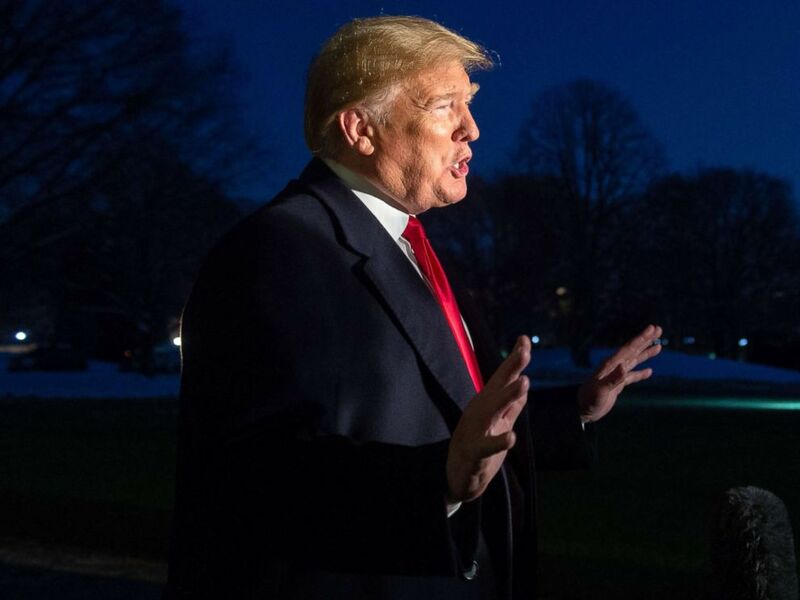 President Donald Trump announced on Saturday that in exchange for border wall funding and ending the partial government shutdown, he would extend temporary protections for so-called "Dreamers" and those with Temporary Protected Status -- two key issues for congressional Democrats who nevertheless held their ground on refusing the president's demand for $5.7 billion in wall funding. "Our plan includes the following," Trump announced in a speech from the Diplomatic Reception Room. "$800 million in urgent humanitarian aid, $805 million for drug detection technology to help secure our ports of entry, an additional 2,750 border agents and law enforcement professionals [and] 75 new immigration judge teams to reduce the court backlog..."
Trump noted that he promised a wall on the southern border during his campaign and “I intend to keep that promise one way or another." It is unlikely that any one of these provisions alone would pass the House, and taken together, they are a non-starter. Pelosi also said that House Democrats would pass a package of "six bills agreed to by House and Senate negotiators and other legislation to re-open government so that we can fully negotiate on border security proposals." After the speech, Senate Minority Leader Chuck Schumer rejected Trump's plan. “It’s clear the President realizes that by closing the government and hurting so many American workers and their families, he has put himself and the country in an untenable position," Schumer said in the statement. "Unfortunately, he keeps putting forward one-sided and ineffective remedies. There’s only way out: open up the government, Mr. President, and then Democrats and Republicans can have a civil discussion and come up with bipartisan solutions." Unfortunately, he keeps putting forward one-sided and ineffective remedies. There’s only way out: open up the government, Mr. President, and then Democrats and Republicans can have a civil discussion and come up with bipartisan solutions. Early Sunday, the president criticized Pelosi and other Democrats for not seeing "crime & drugs"
"They only see 2020 - which they are not going to win. Best economy!" he said in a tweet. "They should do the right thing for the Country & allow people to go back to work." Reaction from immigration advocates was swift and resistant. “Trump must reopen the government now and Congress must not let Trump use the suffering he caused for immigrant youth and federal workers to force his mass deportation agenda on the country,” said Greisa Martinez Rosas, deputy executive director of United We Dream -- the nation’s largest immigrant youth-led advocacy group, in a statement posted to the organization’s verified Twitter account. A spokesperson for an immigrant organization named Make the Road, which has chapters in five U.S. states, called on Congress to "reject any border wall deal from Trump, and to re-open the government right away." Trump’s announcement followed a visit Saturday morning to Dover Air Force Base in Maryland, where the president met with the families of the four Americans killed in Manbij, Syria. At the base, Trump participated in the dignified transfer of Scott Wirtz, a 42-year-old civilian contractor who was killed in the deadly ISIS bomb blast on Wednesday. The four Americans -- an interpreter, a Navy chief cryptologic technician, a Department of Defense civilian and an Army chief warrant officer -- were killed in a suicide bombing last week, the deadliest attack on US military since troops went into Syria. ISIS claimed responsibility for the attack. "I think it is the toughest thing I have to do," Trump said. "When I'm going to meet relatives of some of our great, great heroes that have fallen, I think it might be the toughest thing I have to do as president." 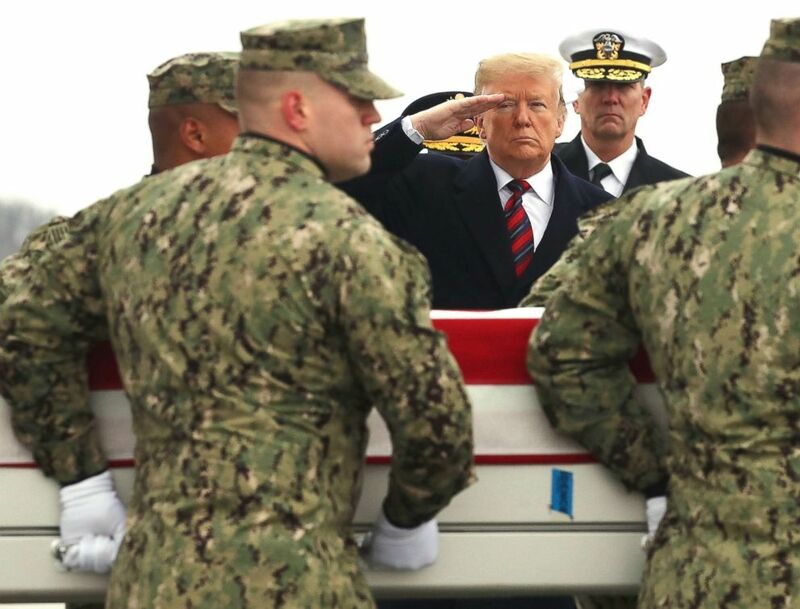 President Donald Trump salutes as a military carry team moves the transfer case containing the remains of Scott A. Wirtz during a dignified transfer at Dover Air Force Base, Jan. 19, 2019, in Dover, Del. Immediate reaction among Trump's base was mixed, with conservative commentators Laura Ingraham and Ann Coulter offering opposing takes on the speech.